In December, the six major Independent Systems Operators (ISO’s) across the country filed their plans for creating new market rules and opportunities for energy storage. While the rules will take at least a year to go into effect and the plans are just an initial step, a recent studysuggests that this effort may add up to 50,000 megawatts (MW) of storage nationwide in the next decade. Provide a greenhouse gas signal: Providing storage operators and regulators with a real-time and forecasted signal for greenhouse gas conditions can improve the emissions performance of storage. This signal has been effective at improving greenhouse gas performancein California’s incentive program (SGIP), but it can become even more powerful when tied to regulatory requirements for incentive programs or market participation. 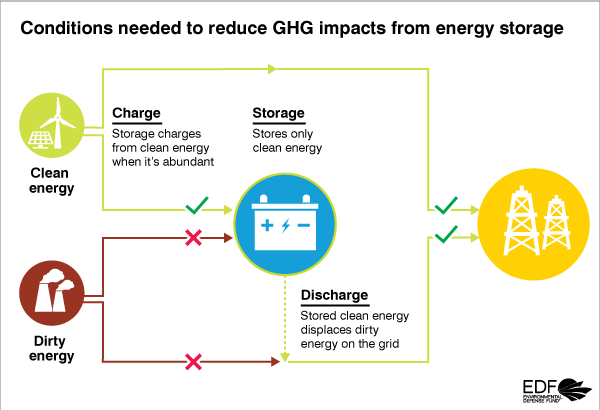 Focus state efforts on rate design and incentive programs:States can influence the performance of storage directly by requiring utilities to develop dynamic electricity rates that reflect grid conditions, which can incentivize storage to beneficially shift its operations. Further, states should incorporate emissions into procurement and planning processes that require energy storage to be supportive of greenhouse gas reductions and clean energy goals.